It’s Not Just A Few Names Leading The Way For US Stocks! You have two options as an investor: you could listen to the media or you could listen to the market. They’ve been pushing the notion lately that only a handful of Tech stocks are leading the way for the market, suggesting a weakening breadth environment. In the real world, however, we are participating in a united rally among Tech stocks as a group. In fact, the Equally-Weighted Technology Index went out just 0.4% away from another all-time weekly closing high, just shy of it’s record high set last month. This is the Equally-Weighted Index, not the Cap-weighted index that the bears are suggesting is pointing to weakening breadth because the big names are such a large portion. If it was true that only a handful of names are going up and market breadth is deteriorating, the Equally-weighted index, which takes the extra-large market capitalization stocks completely out of the equation, would not be behaving this way. And this sector doesn’t even include Amazon. Contrary to popular belief, Amazon is considered a Consumer Discretionary Stock, not Technology. And while $AMZN did go out at yet another new all-time high this week, the equally-weighted Consumer Discretionary Index is less than 2.2% from another all-time weekly closing high. So when someone tells you that breadth is weakening and only a handful of names are driving the market’s gains, you know they haven’t done the work themselves. They’re just regurgitating what they read or overhead somewhere, which happens a lot. 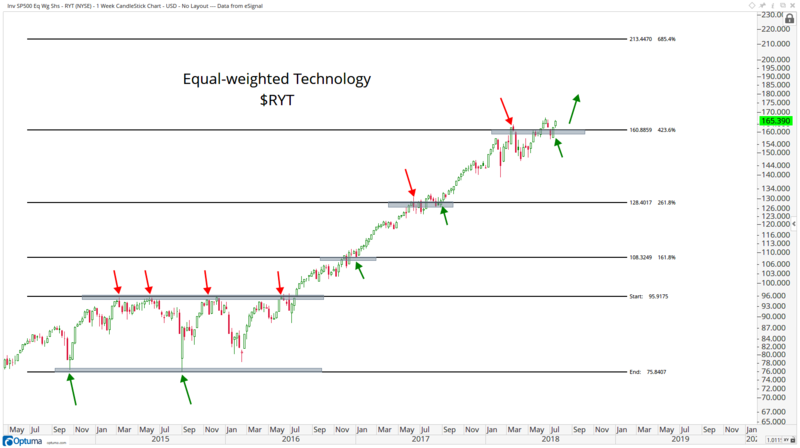 Moving forward if the equal-weighted Tech Index fund $RYT is above 160, we need to be long this sector somehow. We can go as high as 211 here. There are many ways to take advantage (Premium see list here) but staying above 160 in $RYT is crucial for this uptrend to stay intact over the short- to intermediate-term. 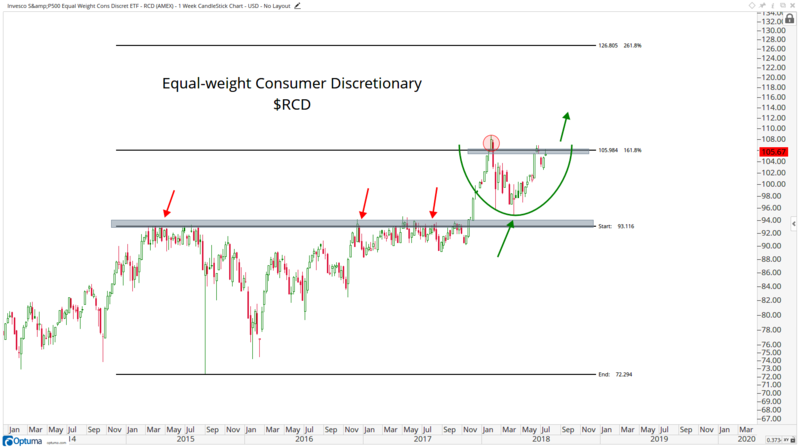 From a confirmation standpoint, it would be incredibly constructive for Discretionaries, and therefore stocks as an asset class, if the Equal-weight Consumer Discretionary Index Fund breaks out above 106. If $RCD is above 106, I think it would confirm exactly what we’re seeing out of Technology. In other words, yes buy stocks! It’s not a popular opinion to be bullish stocks. It feels like it hasn’t been in years. Whenever I speak with journalists and producers they’re always so surprised at my optimism. They’re always telling me they’re simply not used to it. I chuckle every time because these conversations have been happening as stocks make all-time highs, not lows. I’m not sure what everyone is so angry about. Stocks are going up, they’re making new highs, more of them are doing so than not, and the right sectors are leading. Sector rotation is the lifeblood of the bull market and that’s what we’ve been seeing, like the 21% rally in Energy for example. Historically it’s been a good strategy to buy stocks when they are in bull markets.